Officials at Lake Tawakoni State Park say the massive mosquito trap is a big attraction for some visitors, while others will not go anywhere near it. 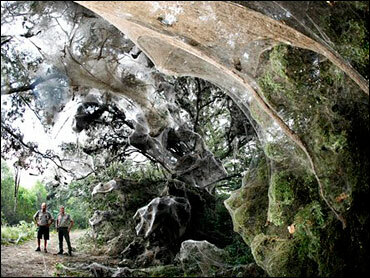 As creepy as it is, it's not the work of one giant spider, but a community of thousands. No one knows exactly why the spiders joined forces, but it's a surprising level of cooperation among the eight-legged engineers that has even insect experts scratching their heads, reports Russ Mitchell, co-anchor of CBS News' The Early Show. "I think its just one of those freak occurrences, amazing things that nature does to wake us up," Garde tells CBS News.